As you may know I have a Piper security device, and quite like it. I have written a lot on this which you can find through this tag – Piper. it has been a while since I last shared anything, but I had a number of things that happened recently that I thought worth sharing. I had a short power outage while I was on the road and while most of my gear is protected with the various UPS equipment I have my Piper was not. 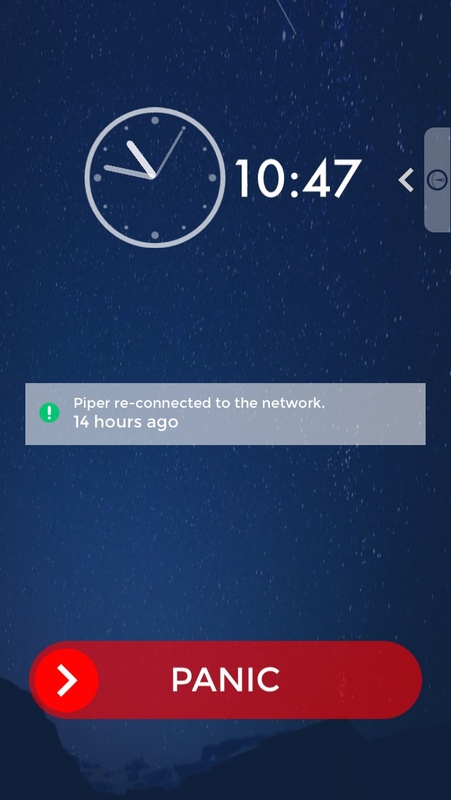 So when the power came back, Piper did not. I have shared this with you in the past, but there has been several updates and it has not been fixed. I also learned something else with this update, and that is when Piper comes back on it is not armed and so it is not safeguarding your world. I have complained on both of these to the vendor. I saw this update the other day and was curious to see what it included. So here it is for you. I think the key bit here is the battery level reporting, and the Bedside mode. I also think the real-time status updates is useful. I think the Bedside mode is cool. Check it out. You can get this from the main screen – just pull the moon out. You can move into and out of the Bedside mode quite easily. Sort of cool and depending on your investment with Piper it can be quite handy. This release seems to be adding more Z-Wave support. 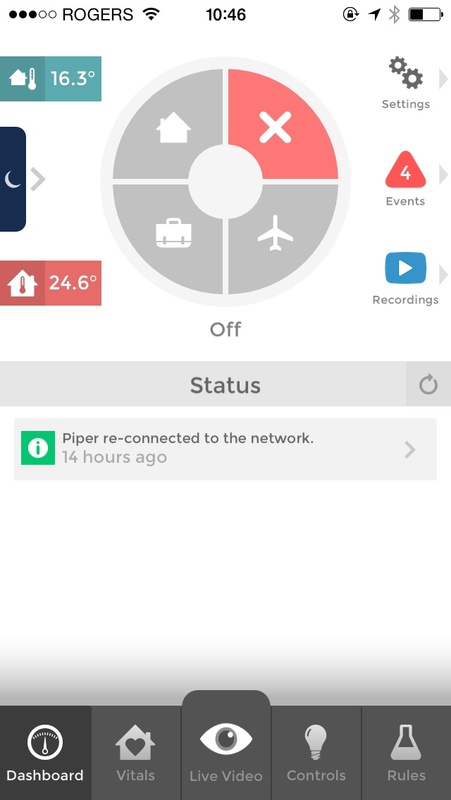 I have said in the past that Piper was a security product that did some home automation and they seem to be improving that. Also, if you did not hear elsewhere, Piper has a new price. It was $299 and is $199 now. See the selection here. I like my Piper. I have not bought a second one as I am also waiting for the Canary to arrive. I like how Canary has a few extra sensors (like Night Vision) and it has a ‘cloud’ that does some analysis. That has some serious upside to it over time. Plus it looks like I will be able to check out my Canary from a web browser and that is useful. But I have seen elsewhere even with the additional cloud related stuff it will not require it to alert us to an alarm condition. So I hope soon to test out Canary and it will determine if I get another Piper or not! Previous Post Wow – this is very cool! Thanks CloudPhysics!! Hello, its been almost 2 years. 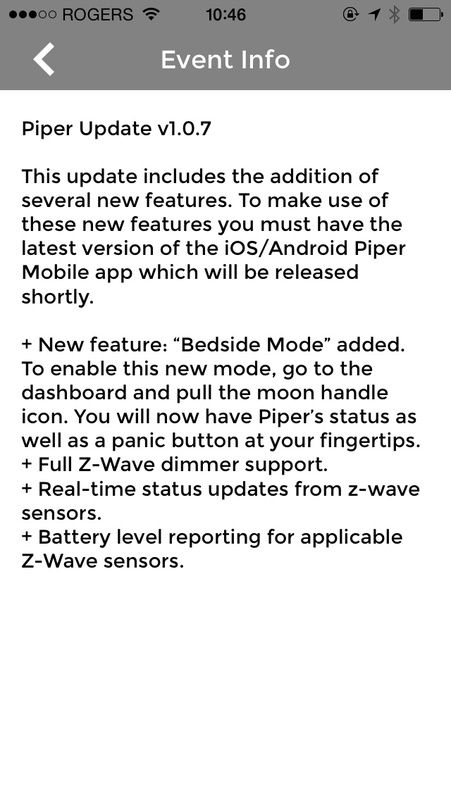 Anymore updates on the Piper? Sorry about no more updates. Not only did I spent most of those two years at a startup, things have not changed as much as I would like. I still have the Piper – two in fact – in my world and it is working well. It still does not have GEO fencing which I think is the biggest single missing feature. you could jury rig something I think using IFTT but I am not 100% sure. Software updates to the Piper have certainly improved it, not necessarily in specific feature but how it works and how more smooth it is. I still think that Piper, and somewhat Canary, are excellent warning systems. Or nice monitoring systems. My experience is they are not quite good enough video to take to court. I also have a DropCam and that video quality is excellent and happy to take it to court. So Piper, and Canary can inform me about what is going on, or warn me, and do that well, but DropCam has the best video quality. Just wondering if you are still using the Piper. I’ve been using it for a few years and generally I’ve been quite happy with it as a monitoring/security system. I did read somewhere that the manufacturer of Piper (iControl) had been taken over by Alarm.Com and it’s not clear at this stage, what will happen existing Piper users. One other point to note, is that I recently wanted to buy some additional Door/window sensors. Previously I purchased a number of Fibaro FGK-10x with Z-Wave+ however when shopping around for these, it would appear that they been replaced with a new model and the reviews are not positive. In addition, Fibaro is now selling the same sensor equipped with bluetooth and which is compatible with the Apple Home kit, but clearly not compatible with Piper, plus it is much more expensive. I’m considering a switch to something fully open source, which would give me greater flexibility, but I hear it can be painful to get everything working. Hi Chris, I am not using my Piper any longer. I am now using Lighthouse due to face recognition. It sort of works too. I hear that SmartThings is the best way to go in terms of supporting a very wide range of options.